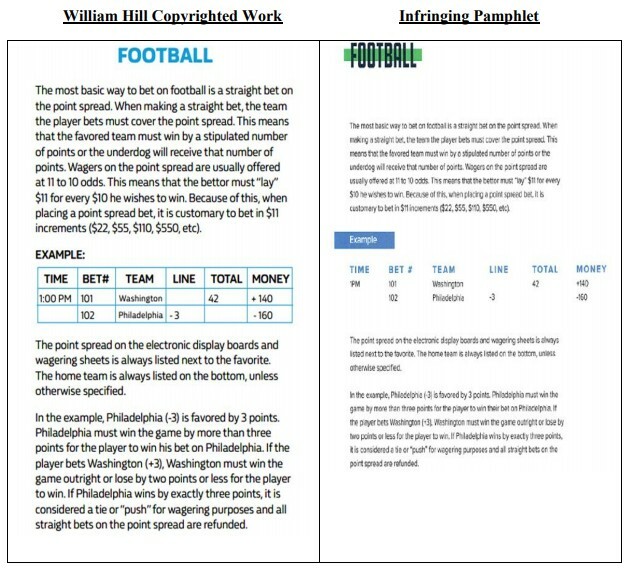 This week, American Wagering Inc., which operates as William Hill US, filed a lawsuit against FanDuel for copyright infringement over a sports betting guide that FanDuel quite blatantly stole and repurposed for its own business uses. William Hill filed the action on October 23, 2018 in the US District Court for the District of New Jersey, seeking an immediate injunction against FanDuel and, eventually, a trial by jury in the matter. According to the complaint, William Hill US created a pamphlet called the “How to Bet Guide”, which it distributed freely to bettors at the Monmouth Park and Ocean Resort Casino sports books in New Jersey; both books are operated by William Hill US. In late July, William Hill US discovered that FanDuel had introduced a “How to Bet Betting Guide” (note the insertion of one redundant word), branded by “FANDUEL SPORTSBOOK”, which FanDuel was distributing at its sportsbook at the Meadowlands in northern New Jersey. 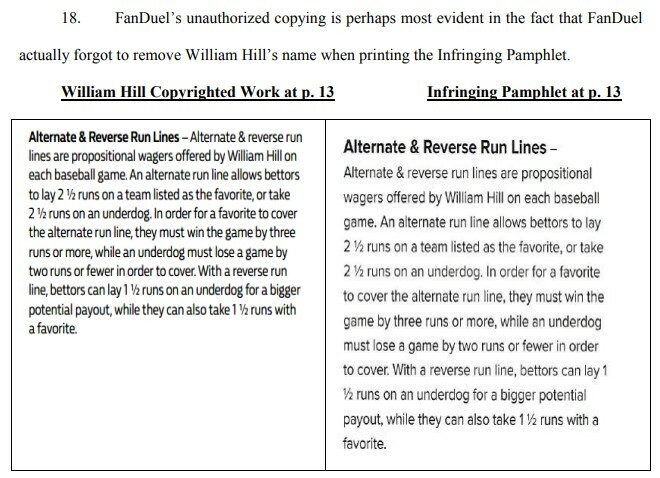 To say that FanDuel “borrowed” from William Hill’s fully-copyrighted pamphlet would be more than a slight understatement. 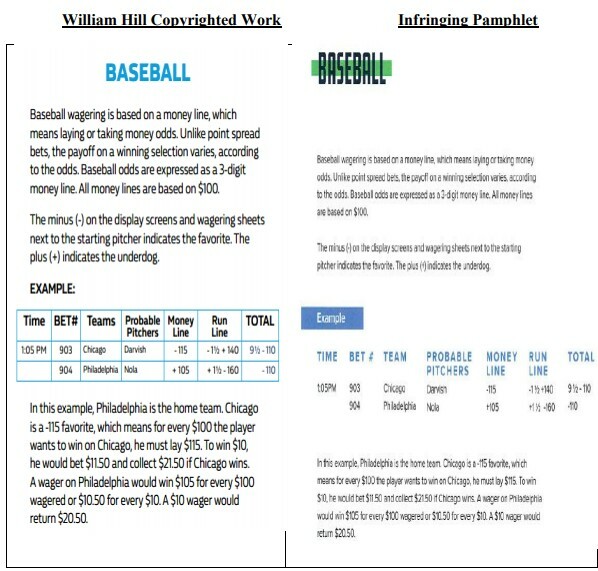 As detailed and illustrated in both the complaint and over a dozen supporting exhibits, the pamphlet’s text was baldly copied by FanDuel not only for its own competing pamphlet, but was also utilized on several different FanDuel online pages. 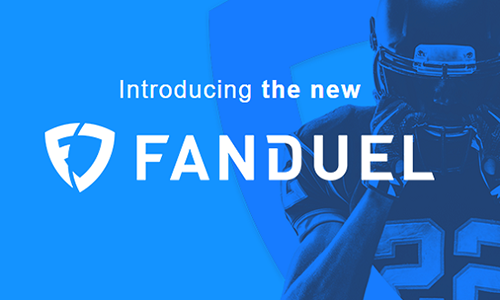 The allegations, if true — and it’s hard to imagine any scenario in which the allegations aren’t true — demonstrate shameful behavior by FanDuel in the corporate, collective sense. Such willful misappropriation including numerous online pages by Fanduel indicate that several FanDuel employees were involved in the repurposing of the stolen content. 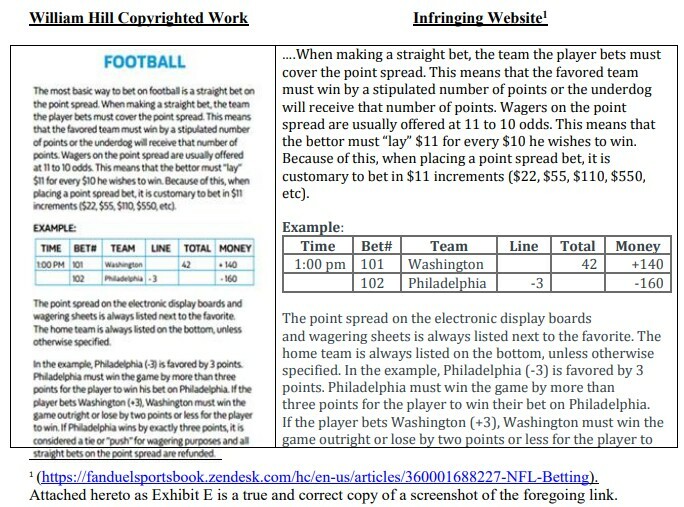 William Hill US is asking for the maximum penalties allowable by statute, along with any profits derived through the publication of the illicit material. One can only hope such penalties will be significant. We’ll see how long it takes FanDuel to modify these pages, even if such modification would be a tacit admission of the theft. Gah, double gah and triple gah. Think of all the sets of eyes that had to be involved in stealing and repurposing the content, including those involved with printing the pamphlet. Everyone who writes or produces content for a living should be appalled at FanDuel’s behavior here. Just as an example, a part-timer at another site I write for stole a few paragraphs of non-quote text from another site a short time back. He was summarily fired. Here, several heads should roll, and William Hill should be awarded everything they’re asking for in the lawsuit. Content theft is a systemic and widespread problem in the creative world. I’m not exaggerating when I say that someone is stealing my work virtually every day, and it’s clear what side of this issue I’m on. Usually (in the majority of the stuff affecting me), it’s some POS affiliate wannabe or underfunded local rag that swipes my work. Here, it’s a big corporate player showing wanton disregard for others’ efforts. And that makes it so much worse.